How to Sync Samsung Phone and Tablet? Home > Resources > Transfer > How to Sync Samsung Phone and Tablet? Some Samsung users like to create a calendar event or write a note on their Samsung phone, and they want to sync these files to tablet for business. Meanwhile, Some users download a wonderful movie on Samsung Galaxy phone and want to watch it in a larger tablet screen. Or some just want to sync important privacy data between Samsung phone and tablet. Here comes a problem - how to sync Samsung phone and tablet? In this article, we provide 3 useful tools. The first one is a professional data transfer that allows you to move files with one click (you can have a quick look in Part 1 and learn its usage in Part 2). The second one (in Part 3) is an official software that helps sync Samsung phone to Samsung tablet. The last one (in Part 4) is Google account that allows to sync Samsung devices from cloud. 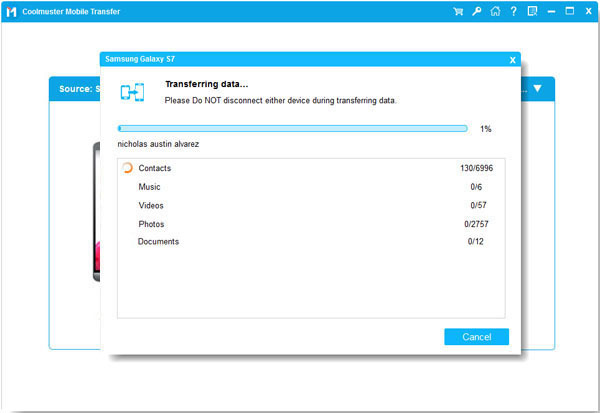 If you want to move several types of data at one time, we recommend Samsung to Tablet Transfer - Samsung Data Transfer to sync Samsung phone and tablet directly. It is an effective mobile transfer tool which allows you to transfer data from one device to another one with clicking once. The program can work under four modes: Android to Android, Android to iOS, iOS to Android, and iOS to iOS. You can sync Samsung phone to Android tablet/ iPad under different modes. Samsung phone to Android tablet - Contacts, call logs, text messages, photos, music, documents, videos, and apps. Samsung phone to iPad - Contacts and documents. Android devices: Phones and tablet with Android 2.0 to Android 9.0, such as Samsung Galaxy S10e/ S10+/ S10/ S9+/ S9/ Galaxy Note9/ Note8/ Galaxy A9/ A8, Samsung Galaxy Tab S 10.5, Galaxy Tab S 8.4, Lenovo Yoga Tablet 2, Google Nexus 9 and so on. iOS devices: Phones and tablet with iOS 5 to iOS 12, including iPad Mini, iPad Air, iPod, iPhone X, iPhone 8+/ 8/ 7 and so on. How to Sync Samsung Phone and Tablet with Samsung Data Transfer? Step 1. Run Samsung to Tablet Transfer - Samsung Data Transfer on your computer. If you launch the program, you can enter the interface as below. Please connect Samsung phone and tablet to your computer via two USB cables at the same time. You need to enable USB debugging if prompted. Step 2. Correct the devices' positions. Please make sure that the source device is on the left and the target one is on the right. Otherwise, click Flip to change their sides. Step 3. Select the files and start to transfer. Once your Samsung phone and tablet are detected by the program, you can get a list of file types. Now, you can select what you want to sync from the middle panel, tick on the boxes and click Start Copy. Step 4. Wait one minute to complete the process. You can check the transferring process in the following interface. The duration is up to the data size you have chosen to sync. Samsung SideSync is new solution for Samsung users to share the screen and data between Samsung tablet and Galaxy phone. You can use it to sync your Samsung Galaxy to tablet. It supports Samsung phone with Android 4.4 or higher and Samsung tablet with Android 5.0 or higher. - Share the Galaxy phone screen to tablet. - Control Galaxy phone on the tablet. - Receive phone calls and exchange text messages on the tablet. 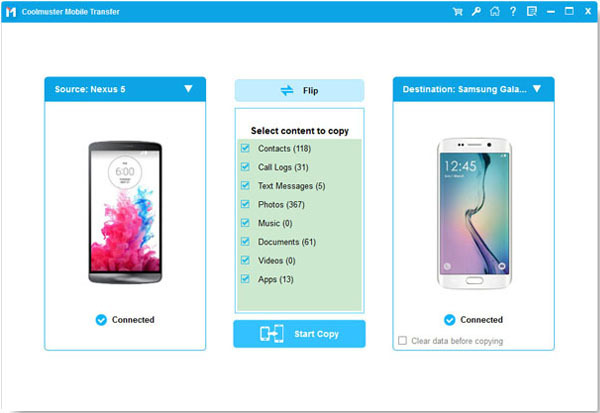 - Seamlessly sync media files between Galaxy phone and tablet. - Sidesync may not work on some device models. - Can not be used on Galaxy S9 or S9+. Step 1. Download and install the software on both Samsung phone and tablet. Step 2. Launch the software on Samsung phone and tablet. Step 3. Connect your Samsung Galaxy phone to tablet via a USB cable or Wi-Fi. Step 4. Select the features as you need and you can simply sync Samsung smart phone to tablet. Please visit Samsung Official Website for more details. Google account is a reliable tool for Android users to backup and restore mobile phone data wirelessly. Commonly, we use it to sync files from cloud to Android devices. You can upload your Samsung data to Google account and sync the data to Samsung Galaxy smart phone or tablet using the same account. Of course, you need to create an account on Android device if you do not have one. App data, calendar, Chrome, Gmail, videos, music, photos, contacts and so on. Please go Settings > Cloud and accounts > tap on Accounts > tap Google > select the content that you want to sync to tablet > tap More (the three dots button) > Sync now. The process may vary from different devices, you can search more help from the official website. How to Backup Samsung Galaxy to Cloud? 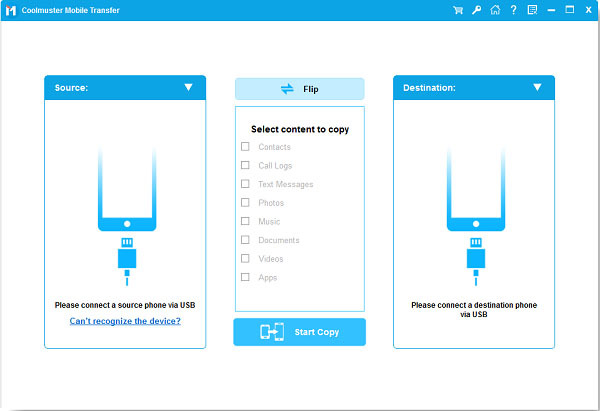 You can select one method as you like to sync Samsung phone and tablet. Google account is the most common tool for Android users to backup, restore and share Android data. SideSync is a new Samsung data sharing tool, but it still has some limitations. Samsung to Tablet Transfer - Samsung Data Transfer is the most effective and compatible one which can move several types of files by one click.